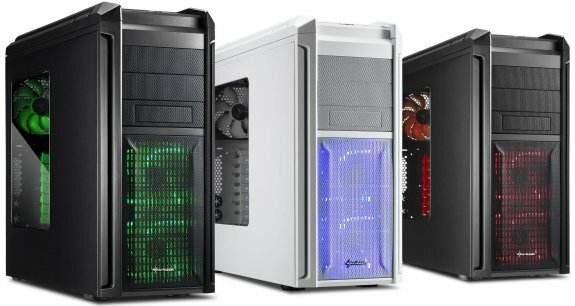 Sharkoon is expanding their product line of Gamer cases: The Sharkoon Tauron ATX is characterized in particular by its flexible hard drive assembly, which makes room for extra-long graphic cards when needed. There is also an efficient air flow system and two USB3.0 SuperSpeed ports on top. The ATX case with mesh front, painted interior and acrylic side window provides three 5.25-inch drive bays for optical drives. One of the bays alternatively supports an external 3.5 inch hard drive. Therefore a total of up to seven hard drives in either 2.5 or 3.5 inch format could be used. All mounting frames come with screw holes for both sizes. With the placement of storage disks, the Sharkoon Tauron grants a high-degree of flexibility thanks to the modular hard drive cages: With the firmly installed front cage for three storage disks sit two additional, removable frames. 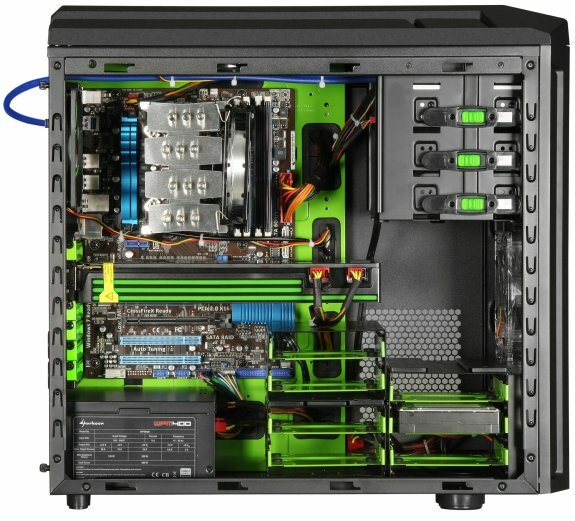 If necessary, one or both modules can each be mounted behind the front cage - in order to create more room for either the air flow or for one 42 cm long high-end graphics card. The components installation requires a CPU cooler mounting hole in the mainboard plate and quick-fasteners for the optical drives. The mainboard plate also has feedthroughs for clean cable routing. For water cooling fans the rear side of the case provides four rubberize hose guides. To quiet PC operations, case feet and also screw holes for power supplies and 3.5 inch hard drives are provided with rubber bumpers to guard against audible decoupled mistakes. The Tauron also brings an efficient air cooling concept. Cool air for the CPU and hard drives is supplied through the two dust filter protected 120 mm LED fans in the front as well as the air intakes on the side. Also, a dust filter is fitted over the air opening for a bottom positioned power supply. The removal of warm air is due to the superb 170 mm fan on the ceiling of the case and a 120 mm fan in the rear. Optionally, an additional fan with either a 120 or 140 mm edge length can be installed on the floor of the case. The pre-installed fans are equipped with a three- and four-pin power supply connector, so that they can be regulated either over the mainboard or over the two pre-installed fan control systems. The two fan controls are located together with audio ports, power and reset buttons, and two USB2.0 and two USB3.0 ports as a top I/O under a protective lid on the case cover. An adapter will be needed with the internal connection of the two SuperSpeed ports which is included within shipping. The Sharkoon Tauron measures 510 x 205 x 495 mm (L x W x H), weighs 9.5 kg and is available in three different versions to choose from: Red Edition and Green Edition with a black body and interior finish and LED fans in the respective color, and as a White Edition with a white body and blue LED fans. End customers will find the Sharkoon Tauron case available in authorized retailers.